These 7 Tips Will Get Your Home Sold Fast! A spotless and fresh home will give buyers a great impression on your home, and even if you think furniture or floors are tired, adding some throw cushions or a little shine goes a long way. Decluttering is also something you should put time into. Excess furniture, children’s toys, or your magazine collection need to get out or get organized in a visually pleasing way. It can be hard to imagine yourself in a space with someone else’s family photos everywhere! Items such as family photos, religious items, collectibles or memorabilia can deter a buyer at an open house or viewing. Do yourself a favour and rid the space of any personal touches that make it hard for a potential buyer to see themselves in your home. Sometimes living in a home for a number of years causes you to get comfortable, which is wonderful since it is your home…except when you are trying to sell! When preparing your house for sale, consulting with a home stager who can arrange the furniture in your main living spaces in a way that is conducive to conversation or entertaining makes your home feel more open and inviting. And the good news is – spending a bit of money on a home stager now can bring you thousands of extra dollars in an offer on your home later. Think about the way your home looks from the street. Do you see neatly landscaped lawns and gardens? You don’t get a second chance to make a first impression, and as your potential buyers walk up to your home, their first impression is exclusively based on what they see from the outside. Make sure that first impression gets them through the front door! Maybe orange is your favourite colour or you have a thing for brightly patterned wallpaper, but either way, buyers may not be able to see past your unique tastes. Swap intense hues for light, warm neutrals that make the space a blank canvas for potential buyers to add their own personal touch. Your little bundle of fur may be your favourite part of coming home, but potential buyers may not feel the same. Hyper pets and pet smells and messes may turn a potential buyer off. Make sure you keep pets in a confined space when showing your home, freshen up those unpleasant odours, and tidy any spaces in which pet toys may take over. Make it feel like home! If you want to make your house feel like home for your potential buyers, baking fresh bread or cookies, or putting on a pot of coffee, can help to add a friendly scent. Studies have shown that potential buyers connect better with homes that smell good! Have questions about listing your home or how it shows? 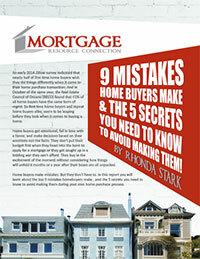 Call or email me today at (519) 868.6794 or rhonda@rhondastark.ca.